1966-1968: Was a member of the Peace Corps, stationed in the Dominican Republic. 1969-1975: Served in the U.S. Army Reserves. 1972-1974: Practiced law in a private firm. 1974-1980: Elected to Connecticut's 2nd District U.S. House seat. 1980: Elected to U.S. Senate. 1994-1997: Served as Democratic National Committee chairman. 2004: Re-elected to his fifth term in the U.S. Senate. Dodd's father, Thomas Dodd was a prosecutor at the Nuremberg trials. The elder Dodd was elected to the U.S. House in 1952. Four years later, he ran for the U.S. Senate, but lost to Prescott Bush, President Bush's grandfather, according to the Almanac of American Politics. Thomas Dodd won the Senate seat in 1958. We Democrats have a job to do and that is to unite this party, attract independents and Republicans seeking change to join us ... and elect a Democrat to the White House and to hold on to the House and Senate. Recently served as Dodd's chief of staff in the Senate. A former executive vice president at the Washington-based lobbying firm Cassidy & Associates. 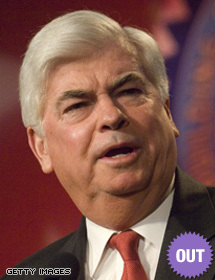 Veteran fundraiser who served as the national finance director for the senator's re-election in 2004. Voted for use of military force in Iraq, but says his vote was based on inaccurate information provided to Congress. Voted for war spending bill that would have withdrawn most U.S. troops by March 2008. Says Americans would be safer if U.S. never invaded. Proposed plan for Iraq that includes phased redeployment of troops over a 12-18 month period and improved recruitment and training of Iraqi security forces. Opposes Bush plan allowing workers to divert some Social Security payroll taxes into private retirement accounts. Opposed 2001 and 2003 Bush tax cuts. Opposed extending tax cuts through 2010, saying they primarily benefited the wealthiest Americans and increased the deficit. Supports tax incentives for businesses that invest in employee health care, pensions and innovations.